I love the potato. There, I said one of the most stereotypical Irish things that could ever come out of my mouth. I really do love it though and I could eat it in any shape or form (except that powdered or ready-made instant mash crap). It was a golden moment last week when I found potatoes large enough to bake in my local Edeka. What a versatile and delicious food it is yet I always get slagged when I mention how much I like to eat it. Those conversations are usually calm and do not include me showing people into a secret, potato-filled room in my apartment. So I have decided to rebel in the only way I know how, write a blog post, and present some facts which will highlight just how cool the potato is! 1. Once upon a time, only in a place called Alaska, the potato was more valuable than gold. 2. In 1995 the potato became the first vegetable to be grown in space when seeds were germinated on the space shuttle Columbia. 3. Good news for fans of mash: humans can apparently survive on a diet of just potatoes, and milk or butter, which contain Vitamin A and D, the only vitamins missing from the humble spud. 4. 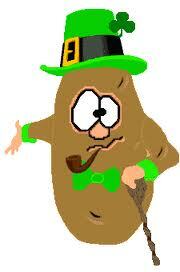 The world’s only Potato Museum is located in Washington D.C.
5. At one time Ireland was so dependent upon potatoes that when the potato crops were destroyed by blight in 1845 and 1846, over one million people died and another million left Ireland to find food.